Well, I was joking the other day that it’s too bad Silicon Alley, the popular name for New York as tech center, isn’t still thriving. Apparently, I’m wrong. The New York Times today reports Silicon Alley is again on the rise, fueled partly by the Web and blog publishing. So, clearly, that means upstart music technology blogs that obsess about robotic drummers and soft synths. 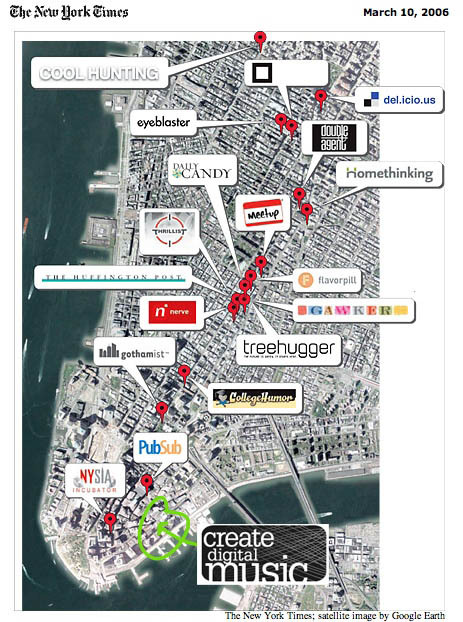 To help out the NYT, I’ve generously located CDM’s beautiful Water Street headquarters on the map. Apparently I’m around the corner from an incubator that houses the former founder of SonicNet. Now that you know where I am, feel free to stop by with your venture capital. Seriously. We can go grab a drink at Ulysses.